Wonder what those three things have in common? I first told you about Swagbucks here. Since then, I have continued to use Swagbucks to search to web (it’s especially easy to use, since I added the Swagbucks toolbar to my browser) and my Swagbucks balance continued to grow. Once I have enough, I am able to cash my Swagbucks in for prizes…………I always go for the $5 Amazon gift cards. Once I receive the Amazon gift cards in my Swagbucks account, I just drop them in my Amazon account……so that money is just sitting there waiting for me to use it. became more and more possible. After being patient for a few months, I was able to purchase this beauty for half price!! ………had I waited a little longer, I could have gotten it for free…….but patience is something I don’t have much of! I’m now saving up for Christmas purchases!!! I am LOVING my new black shinny baby! Butter Cream frosting was a cinch, but I really cant wait to mix up a batch of cookies and royal icing! !…..No more standing for 10 minutes with the hand mixer!! Have YOU signed up for Swagbucksyet? Search the web, earn Swag Bucks and trade them in for great stuff, like gift cards for Amazon.com, Barnes & Noble, and PayPal. It’s not too late to start saving for the holidays!! Are you ready to sign up? Click here to join! Now it’s your turn, let us know what you’re lovin’ this week! If you have something to share with us on your blog, add your link below. EDITED: Sorry, but this linky widget it no longer avaiable. WooHoo! I love my Kitchen Aid too! I also love Swagbucks! CoNgRaTuLaTiOnS!! I joined Swagbucks a while ago, but haven't made much use of it. You have inspired me to get back to it! 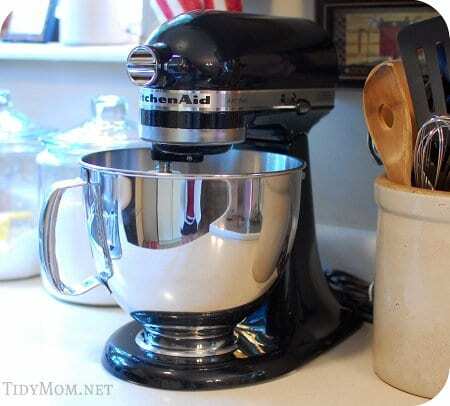 ENJOY your new mixer – You SOOOO deserve this! This is on my "mommy toys" list. Have fun! Oh the possibilities with this little jewel!